The Dodo Dragon and other stories. 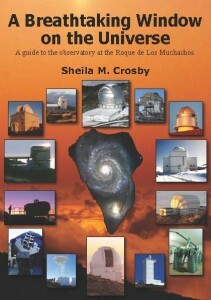 “A Breathtaking Window on the Universe: A guide to the observatory at the Roque de los Muchachos SECOND EDITION” By Sheila M. Crosby (Non-Fiction Paperback) 164 pages (16 more than the first edition) Welcome to the Roque de Los Muchachos, where 15 telescopes from 19 nations use the best night sky in Europe to explore the cosmos. Find out what it’s like to work in this strange world above the clouds…. This is the Canary bellflower, Canarina canariensis, which has no close living relatives. It scrambles over things, like bindweed, with a stem up to 3 m long, and produces these lovely flowers in December. All the examples I’ve found so far this year are in Los Tilos, on the road up to the visitor centre. This is the first page of “Mr Pock-Pock”, one of the stories in my anthology, “The Seer’s Stone”. Click on the link for a larger version. It makes a great Christmas present for a child aged between 10 and 12. You can get more information about the book (and how to buy it) here.